Purple, white and green. These 3 colors represent the National Women's Social and Political Union, known as Suffragist. 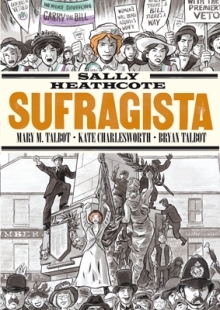 This is the story of Sally Heathcote, a domestic worker in the service of Emmeline Pankhurst, founder of the NWSPU movement. The proximity of that environment will convince young Sally about the suffragist cause. Civil disobedience, political strategy, learning from direct action... will dictate the feminist path of Sally in her fight for female rights and other great achievements for generations future. Mary Talbot (writer and expert on gender issues), Kate Charlesworth and Bryan Talbot (both well-known artist) worked together in this update vision of female vindications. As you see on the previous link, only first chapter is free available on the Ediciones La Cúpula website.